JELLICE collagen peptide is manufactured from gelatin (porcine & fish). It is pure (>90% protein), white, low odor, low heavy metal, low molecular weight, and suitable for use in supplement/food products. Animal skin contains high level of collagen. JELLICE manufactures fresh porcine and fish skin into gelatin and then into collagen peptide. After unique enzymatic hydrolysis, JELLICE collagen peptide is pure (>90% protein), white, low odor, low content of heavy metal and small molecular weight (2000 & 4000 kDa). 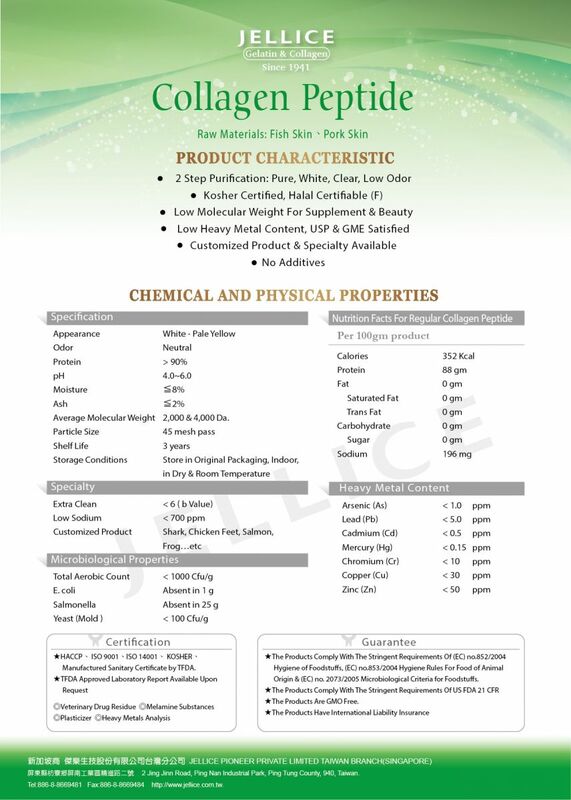 It is suitable for supplement, health/functional food, cosmetic and skin/hair care products. Pale yellow ~ white powder, soluble in cold water, neutral taste. It is an excellent source of protein. It has most of the essential amino acid that human need. In addition, it contains high level of glutamine that may assist brain functions, and lysine which promote the activity of Growth Factor. Collagen peptide has been hydrolyzed and does not gel under low temperature. It can be added into drinks and soups to increase intake of protein/collagen. Collagen peptide stabilizes emulsion, and prevents precipitation or agglomeration of insoluble particles. The mixture remains homogenized. Collagen peptide forms a layer of film on the surface and it may protect from physical and chemical harm. It has been widely used in skin/ hair-care products.